In the year 2010 I started with the idea of a Coalition of Joy. Having experienced the inspiration of laughter since 2000, I knew many other laughter teachers and joyful initiatives. I wrote then wrote my book „The Age of Laughter“ in Goa, India. Co Cosseron of the International School of Laughter, France, was amidst the first ones to support the coalition, as well as Madan Kataria, Steve Wilson, and Steve Bhaerman (Swami Beyondananda). I expected a vivid, creative exchange and a wild, funny and revolutionary explosion of joy and co-operation, but that did not happen. So I released it a year later, but the idea came back to me after we had visited South America from January to March 2013. We met so many inspired laughter teachers and happy people that I decided to start again. The most important are Annelie Gareis and Ricardo Llorente, Ecuador, and Tosha Tobias, Chile. In the spring of 2013 I started again, setting up websites, founding groups on Facebook, and preparing our next journey. The online-friendship with Steve Bhaerman became important at this time. Steve is a spiritual comedian and great writer, quite well known in the US, and he supported me with advice and invited me to come to the US to exchange ideas. He also was optimistic that spiritual authors like Bruce Lipton, Barbara Marx Hubbard and others would joyfully join the coalition. I wrote snail mail letters to some of them from Switzerland, but nobody answered. 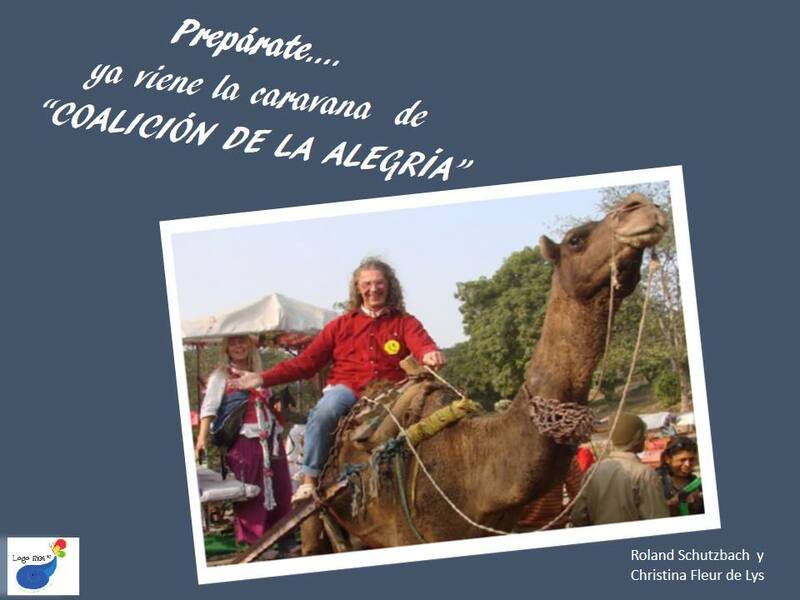 At the same time we prepared to go to Mexico, since it seemed to be a country of laughter yoga leaders, and since we love Spanish-speaking countries anyway. Our plan was to stay in California in November, and to enjoy Mexico in December and January. 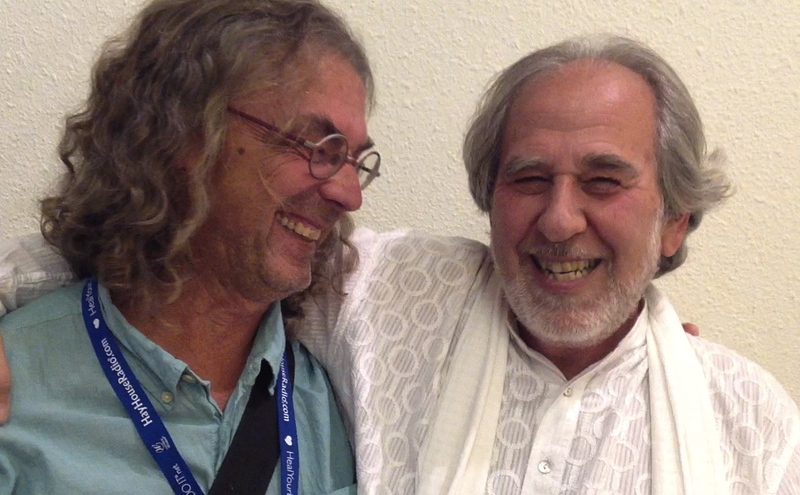 At a conference in Pasadena on Nov 8, we met Bruce Lipton, and we made friends with him. He gave us interviews and even invited us to meet him in his home town Santa Cruz on our way from L.A. to San Francisco. We also met Jeffrey Briar and Sebastien Gendry in Laguna Beach and Pasadena, two highly qualified laughter masters, and had so much fun and some interviews with them. Jeffrey took us to a laughter yoga session with seniors at a center, and we improvised four hands together at a public piano meeting. After that, we stayed for three nights in the home of Sebastien, Pasadena, and had great conversations with him of the highest spiritual level, hahahaha, and also interviewed him about the deepest and highest questions of life. 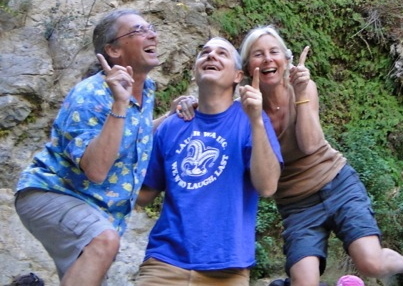 Sebastien has developed an online training for laughter yoga teachers which he showed to us. It is fascinating how he systematically goes through a curriculum with his students. „I have brought laughter yoga to a new level“, he proudly states. Being with him for some days, we felt the spiritual friendship very strongly, and we laughed a lot! At the same time we prepared our journey to Mexico, and we are invited to give our workshop „To be happy is a quantum activity“ there. Also, we will have a celebration of the Coalition of Joy on December 15 in Mexico City. The caravan of the coalition of joy approaching Mexico! The coalition of joy is also a book project, but I don’t really find the time to write during the journey. So the focus has changed a little: I enjoy so much the face-to-face-meetings, the spiritual exchange, the spontaneous friendships. Basically, all is said about laughter and joy: It is good for your health, it is a spiritual path, bla bla bla, we all know it. The funny photos are everywhere in the network, hahahaha, but the don’t tell us anything unless we are part of this group. The coalition of joy wants to bring our movement to a new level, which is the level of no-mind and of pure enjoyment in connecting with each other. Bruce Lipton put it like this in his presentation in Pasadena: When the amoebae could not develop further, they discovered the possibility to form groups, and these groups were more differentiated then one single amoeba. Accordingly, one human is limited and gets to a higher level by creating humanity. For me, it would be enough to create and enjoy a playful coalition of joy, laughter, and love, and to celebrate it every minute! I do! I enjoy every moment with my wonderful laughter angel Christina on this magic journey, and I am very happy that there are so many other joyful people on the planet! Already now, for me the Coalition of Joy has been a great success: Through it, something new is created and celebrated, and more friendships around the globe are flourishing. 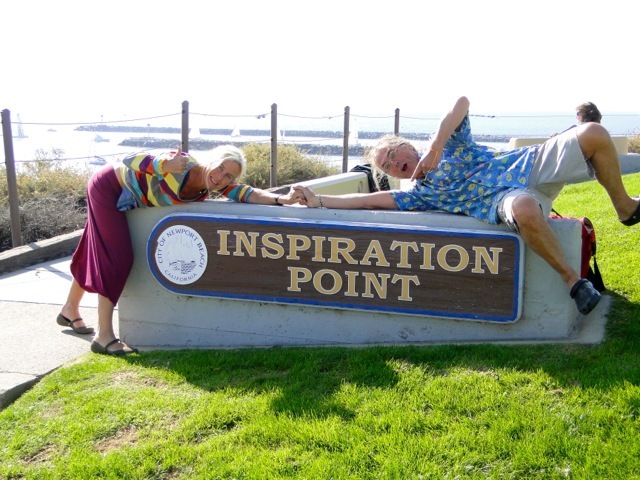 We got our biggest inspiration at inspiration point! This point is very difficult to find; you need a spiritual guide and a pure heart and lots of luck to find it. It is hidden along the coast of California in some unknown remote place, and don’t dare to go there without a trustworthy shamanic guide! We had one, and leaning over this point gave us the greatest inspiration in our life time: Be happy! Wow! That’s why we now celebrate our honeymoon every day!